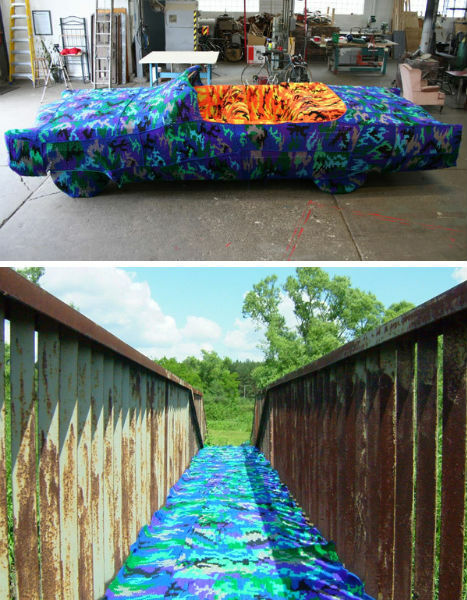 A genderless figure in head-to-toe crochet camouflage lounges on a crochet-covered chair atop a crochet rug, surrounded by crochet wall hangings that say things like “Wake up and play with me.” In another scene, a crocheted person stands beside what resembles a gigantic car cozy. 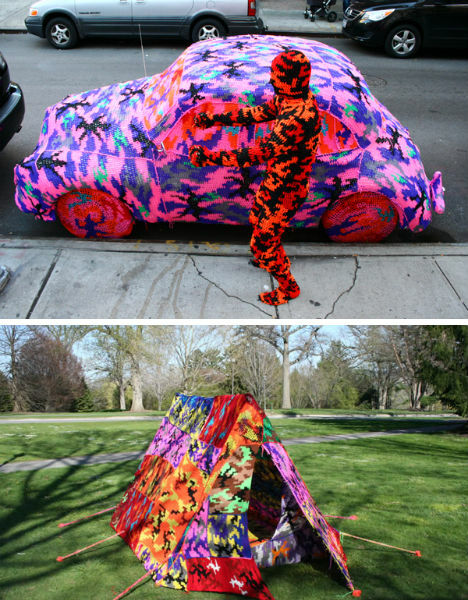 Polish-born Brooklyn-based artist Agata Olek definitely isn’t making boring blankets or grandma sweaters – she’s working her needles like a madwoman on the most bizarre and unexpected things. 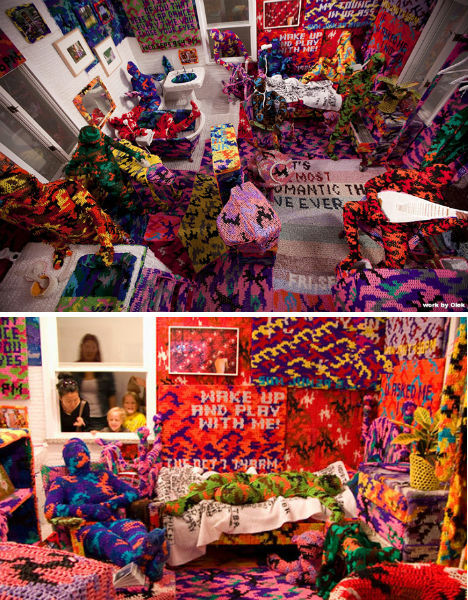 At her recent solo exhibition entitled ‘Knitting is for Pus****’ at New York’s Christopher Henry Gallery, Olek covered practically every square inch of the space in multi-colored crochet, but the installation was just a home base for a range of work that also includes costumes and sculpture. From that gallery burst forth groups of performers outfitted in holey camouflage, looking like deranged robbers debuting a new kind of disguise, holding signs or laying down on benches to be observed and puzzled over by passersby. Gallery visitors were even provided with a map to find more of her installations across the city. Olek’s interest in crochet began in early childhood and intensified after she graduated from college with a cultural studies degree and found herself wanting to work on art while watching movies. Crochet proved to be the perfect medium, and the artist even occasionally knits in front of a live audience while surrounded by her work – hidden by a crochet ski mask, of course.